The Environmental Protection Agency on Thursday announced a nationwide effort to learn more about and better control toxic chemicals in Americans' drinking water across the country. EPA announced a national action plan to regulate and clean up a class of chemicals used in everyday products like nonstick pans and carpets, as well as firefighting foam. The types of chemicals are so common the Centers for Disease Control says all Americans have some level in their blood but residents in some communities are being exposed to much higher levels that EPA says are hazardous for their health. High levels of the chemicals have been found in dozens of communities and drinking water systems serving up to 16 million Americans, though the number is likely to grow as EPA begins a new round of tests. CDC reports and other research have connected exposure to the chemicals to liver damage, high blood pressure, decreased fertility, testicular and kidney cancers, and immune system disorders. In an administration that has prioritized rolling back regulations, and after outcry about reports the agency would not regulate how much of the chemicals are allowed in drinking water, acting Administrator Andrew Wheeler says they consider the chemicals a "very important threat" and are moving forward to set a limit for how much is allowed in drinking water. "What we're doing with this new management plan for PFOS, PFOA. We're protecting Americans drinking water which is very important. We need to make sure that every American regardless of zip code has safe reliable drinking water," he told ABC News Live in an exclusive interview on Wednesday. But in the announcement Thursday, EPA officials said the next step to regulate the chemicals in drinking water will still take months and that doesn't include setting how high the limit should be. Advocacy groups and communities dealing with these chemicals say they've already been waiting for help and EPA's plan doesn't move fast enough. Advocacy groups have called for an immediate limit in drinking water, ban on uses and new versions seeking approval to stop more people from being exposed. The mayor of Hoosick Falls, New York, which has been dealing with chemical contamination from a plastics factory, tweeted he wants EPA to declare the chemicals hazardous now and do more to take them off the market, saying only announcing next steps isn't enough. "As Mayor of PFOA contaminated Hoosick Falls, NY, as someone who had over 20x the national average of PFOA in my blood, and as a parent whose children average a higher PFOA blood count than me, I have a lot to say about this," Mayor Rob Allen tweeted Thursday. "If, like many of us fear, today's announcement will only be the official "beginning of the process" of labeling PFOS and PFOA as hazardous chemicals and of defining groundwater guidelines that require action, then this huge endeavor will come off as a joke." EPA says it hopes to take the next step to set a limit for how much of the chemicals are allowed in drinking water by the end of the year, but that they have to follow a formal process under the Safe Drinking Water Act. 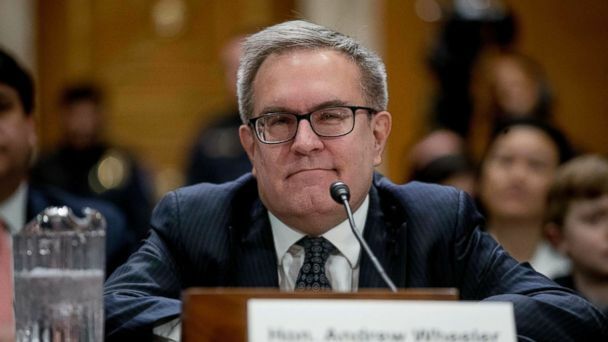 Democrats on the Senate committee with oversight of EPA said the plan being touted by EPA does not do enough to protect people, citing an exchange in his confirmation hearing when Wheeler said he could not promise the agency would set a drinking water standard. Senate Majority Leader Chuck Schumer has threatened to hold up his nomination to become full administrator over the issue. Some critics cite former EPA administrator Scott Pruitt's comments last May when he called the issue a "national emergency" and slated the plan to be released in Fall 2018, but it was delayed by the interagency review process and the government shutdown. "It has taken the EPA nearly a year just to kick the can even further down the road. While EPA acts with the utmost urgency to repeal regulations, the agency ambles with complacency when it comes to taking real steps to protect the water we drink and the air we breathe," Sen. Tom Carper, the ranking member of the committee, said in a statement. "I urge Mr. Wheeler to reverse course and treat this public health threat with the urgency it deserves. And I ask my colleagues in the Senate to take note of Mr. Wheeler's lack of urgency in addressing this threat as they consider his nomination to be EPA's permanent administrator." The two specific chemicals targeted in the plan, PFOS and PFOA, are known as "forever chemicals" because once they're introduced into the environment they're very hard to remove. Research has connected exposure to the chemicals to health problems like immune system disorders, thyroid issues, reproductive problems, and some kinds of cancer. High levels of the chemicals have been found in drinking water for more than 16 million Americans, and more communities have found it in the environment near airfields or former industrial facilities. EPA's action plan lays out several steps the agency will take on the chemicals, including moving on the next step to regulate them under the Safe Drinking Water Act, releasing guidance for when they need to be cleaned up in other sources like groundwater, and declaring them "hazardous" under the Superfund law - which governs clean up at contaminated sites - prompting more cleanup requirements. Republicans like Sen. John Barrasso, chairman of the Senate Environment and Public Works Committee, have also been critical on the issue. In a statement Thursday he called the EPA plan a "first step" and said the committee will schedule a hearing on it this spring. "As I have said before, EPA must speak clearly about the risk that this class of chemicals poses to public health and the environment. The agency must be willing to take decisive action where it is warranted. Industry and the Department of Defense must also play a constructive role," Barrasso said in the statement. The agency says that drinking water systems around the country will be tested for the chemicals at lower levels than an earlier round of testing in 2012, meaning more communities could find out the chemicals are in their water. The plan will also include more research on the health effects of other chemicals in the same category and more communication with communities about the risks of exposure. In the absence of a national drinking water standard, several states have moved to pass their own laws to regulate the chemicals. State officials have asked EPA to provide more federal guidance to prevent confusion and make more resources available for drinking water systems to test for and remove the chemicals. Some advocates have also called for the EPA to do even more to prevent the chemicals from being released into the environment, either by banning them in products or declining to approve new chemicals in the same category. But Wheeler said EPA is working quickly and called the new plan "groundbreaking" because it's the first time EPA has ever taken a multifaceted approach to combat chemicals in the environment. "We haven't slowed down, we've actually speeded up the process. We're continuing research for example, we want to make sure we have the best clean up technologies - that we understand better the health impacts on people and that we can move forward," he told ABC. "But, we have been cleaning up. We've been helping and assisting the states around the country... dozens of sites around the country, we're making sure that those are cleaned up and we're moving forward with additional authorities under all of our statutes. Again, and this is the first multimedia approach in the agency's 49-year history we've ever taken for a chemical like this."